One of the best things about sharing your life with a dog is that your pet is always happy to see you and your guests. However, puppies need to be trained right away to ensure that they show their love in appropriate ways and don't discomfort your guests by jumping up on them. Training a dog takes patience and dedication, but the reward of a well-trained canine companion is well worth the effort. Take your dog to a place where she will not be distracted. A good time to do this is as soon as you get home or let her in from outside. It is important to do the training at the times when she is most excited so that it matches the times when she will be asked to perform the command in the future. A quiet room without any other pets present works best. Dogs are easily distracted and you will need your pet's full attention. Hold your hand out with your palm facing forward when the dog jumps. Say "down" very firmly. This will probably take several attempts before she understands you, and even more attempts before she can control her behavior enough to listen consistently. Give her a small treat if she listens and stops jumping. This reward will reinforce her behavior, a principle derived from the theory of Operant Conditioning by B.F. Skinner, which is widely used in universal dog training. Operant Conditioning pairs an action with a reward. 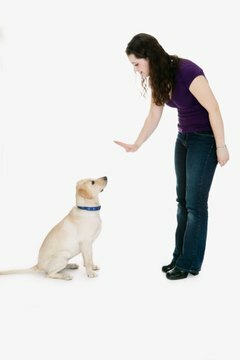 The dog will eventually associate listening to the "down" command with a reward, which will reinforce that behavior. Repeat this activity every day until she learns to stay down on the first command on a consistent basis. Allow guests to give her the "down" command once she responds to the command consistently with you. This may also take several attempts as she will not see the guest as part of her pack and therefore she is less likely to listen to someone she doesn't know well. Replace the treat with a pat and some words of encouragement once the "down" command is well ingrained and she listens to both you and your guests consistently. This way she also won't become overweight from an excess of treats. Never hit your pet or yell at it for bad behavior. This may teach her not to perform the behavior, but it is also likely to make her afraid of you or to defend herself by biting. Do Hamsters Know Their Owners? What to Do If Your Horse Balks While Walking?